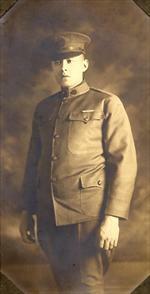 7/10/1919 Joseph Obos enlisted in the U.S. Army at Columbus, Bks, Ohio. He was single at that time. He had no prior military service. Joe was a carpenter and of excellent character. He was processed through Fort Leavenworth, Kansas. 5/16/1921 Joe's enlistment papers note that he had earned a "Marksman" rating.